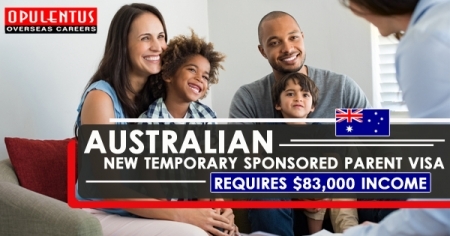 Only those migrants with an $83,454.80 taxable income can sponsor their parents for the latest Temporary Sponsored Parent Visa. The Citizenship, Immigration, and Multicultural Affairs Minister, David Coleman defined the income in the current legislative instrument. Mr. Coleman had published in the previous month that requests to sponsor a parent for this latest visa would be starting from 17 Apr 2019. Once a sponsorship appeal has been allowed, the concerned parent can apply for a Sponsored Parent visa (Temporary). Appeals for the visa are required to open from 1 Jul 2019. The Temporary Sponsored Parent (subclass 870) visa grants grandparents and parents with the latest pathway to rejoin with their children and spend time collectively for a constant period of up to 05 years. There is also the possibility to apply for a 2nd visa for an extra 05 years after a quick period of Australia outside, indicating grandparents and parents can spend a maximum tenure of 10 years in Australia. The income demand for that following sponsorship, however, was not given clear. Now we understand one requires to have a minimum income of AUD 83,454.80 to be qualified to sponsor one's parents for this new visa. The fee of Application is $5,000 for a 03-year visa. The fee of sponsorship is AUD 420. This temporary parent sponsored visa is intended to enable the migrants' parents to spend a long time in Australia. However, the salary cap and additional conditions of the visa have left few migrants frustrating. Many migrants are not able to afford the huge fees of this visa. The requirements are already harder in this visa as relate to normal visitor visa. One need to have health insurance for this temporary parent visa. It is an actively unfair visa against migrants. It will be expensive for those also who manage to satisfy the criteria of income. In case of a visitor visa and should not be this much hard. The government of Australia had promised for a fair visa, but It is not a fair visa. Minister Coleman earlier defended the sponsored temporary parent visa cost, representing it as an affordable charge.